Karma, Luck, or God; Where Have You Put Your Faith ? I hear a lot of people talking about Karma these days. They say, what goes around, comes around; In other words, someday you’re going to get treated the same way you treat other. People say; I don’t worry about getting revenge, I just let Karma take it’s course. But that’s really not what the notion of Karma originally refers to. Karma has it’s origin in Hinduism. Hinduism teaches reincarnation. Reincarnation of course, is the belief that when your body dies, your spirit enters a different body, and continues it’s life there, in that new body. The word “reincarnation” comes from the word “carnate” which means flesh. Reincarnation means to re-enter flesh. So then, the belief is, that when your fleshly body dies, it re-enters into a different fleshly body. And then when that fleshly body dies, the spirit again, re-enters into another fleshly body, and so on, and so on. Now, here’s where Karma comes in; Karma is believed to be what dictates your future state, in your next body, depending upon what your actions were like in your past bodies. So if your actions while in your past bodies were good, then Karma would cause you to experience a “good” state of being in your next body. And of course, if your actions had been bad in your previous bodies, then Karma would dictate that you would end up in a “bad” state of being in your next body. You could say that the “force” that makes that happen, is Karma. So then, you could also say; Karma causes you to reap in your next body, what you’ve sown in your previous body. Now, to me, that general idea sounds like it was borrowed from the bible. But of course those who believe in Hinduism would say it’s the other way around; That the bible borrowed these ideas from Hinduism. The bible teaches that we reap what we sow, doesn’t it? Galatians 6:7 says; “Do not be deceived, God is not mocked; For whatever a man sows, this he will also reap.” Therefore, you WILL reap what you sow. But it’s not something called Karma, that causes it, it’s God who brings it about! But think about the idea of Karma again. Like I said to begin with, people have come up with their own definition of what Karma is. They have the idea, that in this life, bad things will inevitably happen to bad people, and that good things will happen to good people. And they think that this supposed “law of nature” is called Karma. But even in Hinduism, where the idea of Karma originated, Karma only applies to your next life, not to this one. In reality, Karma is superstition. It’s not much different than believing that if you walk under a ladder, it will bring you “bad luck”. Or if you carry a rabbit’s foot on a key chain, it will bring you good luck. You better be careful what you do on Friday the thirteenth, and always have your lucky penny in your pocket. And if you treat people badly, Karma’s gonna get you. Karma is nothing more than superstition. Just like thinking that “bad luck”, or “good Luck” will be the result of doing certain things. 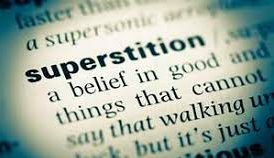 It’s superstition; It’s something that only exists, in a person’s imagination. When I think of “luck”, whether it’s good luck or bad luck, I think of things which happen simply by chance. Like if it happens to rain on the day of the parade. It’s just happened by chance. Just bad luck I suppose. But on the other hand, maybe you went on a vacation, and you had absolutely perfect weather the whole time. The forecast might have been for good weather, but you never know. But it worked out good; You had good luck with the weather. That’s what I mean if I use the word “luck”. It just worked out that way. Do you remember when the apostle Paul was in the city of Athens Greece? The bible says in Acts 17, verse 16; “Now while Paul was waiting for them at Athens (he was waiting for Timothy and Silas to join him) his spirit was provoked within him, as he was beholding the city full of idols.” You see, belief in idols is a superstition. Idols are physical “things”. And when people attribute godlike qualities, to physical things, those things become idols. A “godlike quality” would be the belief that a “thing” has the power to bring good or bad “luck”. It’s as if a “thing” could possess the power to alter the course of events. Superstition is said to be based on fear. Fear, that if you don’t do a certain thing, then something bad will come to you. And the Athenians were so afraid that they might not worship everything that needed to be worshipped, that they even built an alter to an “unknown” god, just in case such a god existed. There is nothing that happens in this life, or in the life to come, that is not controlled by the God of heaven. In one way or another, everything that occurs, good, bad, or otherwise, is the result of what God has ordained, or what God has intervened in, through the exercise of His will, or through His providence. NOTHING happens, that is not in some way, the result of God! Now someone may say; That’s not true. When bad things happen, those bad things are not the result of God. The bad that happens is the result of man’s bad choices, and not the result of God. But the fact that mankind is responsible for all sorts of bad actions, isn’t the point. The point is, that God is in complete control of everything! God has given mankind the privilege, and the freedom, to make his own choices, but it’s God who remains in control. In other words, God has absolute and complete sovereignty. There is no other power in all of creation. God says in Isaiah 44:6; “I am the first, and I am the last, and there is no God beside Me.” Job 12, verse 10 asks this question; “In whose hand, is the life of every living thing, and the breath of all mankind?” The life and the breath of all living things is in God’s hand! That’s whose hand it’s in! There is nothing that happens, to any one, in any place, that’s is not under the control of God. Now, knowing that God is in complete control; Think about the idea of doing something for “good luck”. You might wear a certain color of clothing, because you think that will bring you good luck that day. Or go through a certain routine that is supposed to bring good luck. Someone might have a four-leafed clover, stashed away somewhere, or pressed between the pages of a book; Maybe pressed between the pages of a bible! Does a piece of clothing, or a piece of clover, or a horse-shoe, or a rabbit’s foot, or a pair of dice, or the number seven, have power to do anything? They may have the power to make some people fearful. “Lucky” things, are based on fear. It’s based on the fear that if you don’t have that little charm, or if you don’t do the thing that you believe will bring you “good luck”, then you’ll inevitably receive “bad luck”. Instead of relying on GOD, people rely on things! It’s no wonder that the apostle Paul’s spirit was provoked, over in Athens. And our spirits should be provoked too. When “things” are counted as equal to God. When Karma, is relied upon for justice. Who do you look to for justice? What do you rely on for help when you need help? And for comfort when you need comfort. If you rely on anything besides our God, then you’ll be sorely disappointed. Why should we come to have that kind of peace, when we rely on God? Well, it’s because “We know, that God causes all things to work together for good, to those who love God, to those who are called according to His purpose.” (Romans 8:28) Can Karma do that? Can your lucky bracelet do that? You know they can’t; But God can, and God does! Your value, is why Christ died for you. And that’s why the word was written for you. And that’s why you’re given the opportunity to hear His word, and to believe in God, and in Christ; And to confess your faith, and to repent of your sins, and to be buried in baptism, so that your sins can be forgiven, so that you can be rewarded with eternal life in heaven. It’s not because of Karma, and it’s not matter of luck, it’s a matter of God.